In this monumental book, sociologist Robert Castel reconstructs the history of what he calls "the social question," or the ways in which both labor and social welfare have been organized from the Middle Ages onward to contemporary industrial society. Throughout, the author identifies two constants bearing directly on the question of who is entitled to relief and who can be excluded: the degree of embeddedness in any given community and the ability to work. Along this dual axis the author locates virtually the entire history of social welfare in early-modern and contemporary Europe. This work is a systematic defense of the meaningfulness of the category of "the social," written in the tradition of Foucault, Durkheim, and Marx. Castel imaginatively builds on Durkheim's insight into the essentially social basis of work and welfare. Castel populates his sociological framework with vivid characterizations of the transient lives of the "disaffiliated": those colorful itinerants whose very existence proved such a threat to the social fabric of early-modern Europe. Not surprisingly, he discovers that the cruel and punitive measures often directed against these marginal figures are deeply implicated in the techniques and institutions of power and social control. The author also treats the flipside of the problem of social assistance: namely, matters of work and wage-labor. Castel brilliantly reveals how the seemingly objective line of demarcation between able-bodied beggars�those who are capable of work but who chose not to do so�and those who are truly disabled becomes stretched in modernity to make room for the category of the "working poor." It is the novel crisis posed by those masses of population who are unable to maintain themselves by their labor alone that most deeply challenges modern societies and forges recognizably modern policies of social assistance. The author's gloss on the social question also offers us valuable perspectives on contemporary debates over who should receive social assistance and whether this entitlement should be linked to the obligation to work. 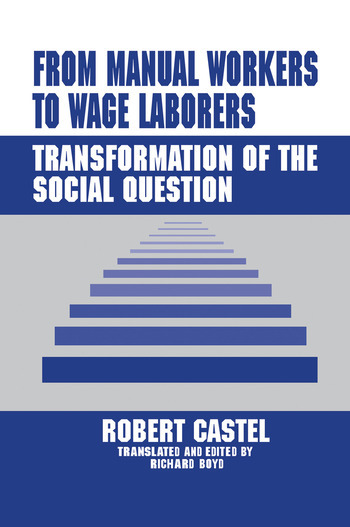 Castel's rich insights and brilliant generalizations are invaluable for anyone concerned with what he describes as the "new social question" of work and social welfare in contemporary society.